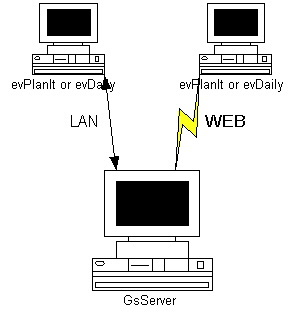 evServer maintains the database of Events and Functions shared by multiple evPlanIt and evDaily computers on a Local Area Network. evServer runs as a Windows Service on Win2000, WinXP, and Exchange Server and is started automatically each time Windows starts. An unlimited number of evPlanIt and/or evDaily computers can share Event information on an evServer. Normally, the computers connect to evServer via a Local Area Network (LAN). Connecting to evServer via the internet is recommended only if you have a high speed connection. 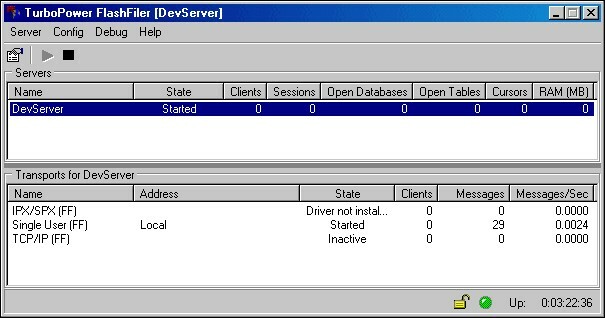 The Server Screen displays the status of evServer. 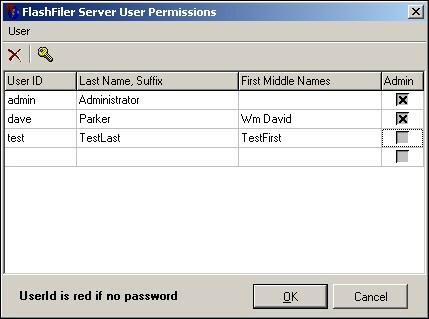 The User Screen displays who is authorized to connect to evServer. To add a user, type a User ID on the bottom line. Optionally, type the Last Name, Suffix, First, and Middle Names. Click at the top of the screen and type an initial password.